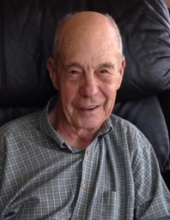 Wayne E. Schlitz, age 83, of Burlington, passed away on Sunday, March 31, 2019 at his home surrounded by his loving family. Born in Burlington on June 29, 1935, he was the son of Edward and Amelia (nee Richter) Schlitz. He was a lifelong resident of Burlington where he attended St. Charles Grade School and graduated from Burlington High School. On August 31, 1957 in Burlington, he was united in marriage to Nancy Fell. Nancy preceded him in death on March 7, 2008. In 1962, Wayne started Schlitz Vinyl and Carpet Company. He successfully ran his business for 39 years, retiring in 1997. He was a member of the Burlington Jaycees and Lions Club, Town Fryer “Breakfast Club” and Tuesday Hackers Golf League. He enjoyed bowling, fishing, gardening, playing cards with his friends and spending time with his family. He especially enjoyed playing Sheepshead. Wayne was a very generous person and gifted craftsman; making many wooden toys for family, friends and charities. Wayne is survived by his children, Jeanne (Kurt) Otter, Joan (Robert) Kawalec and Julie Schlitz; grandchildren, Rachel, Lauren and Lance Otter and Carly and Andrew Kawalec; sisters-in-law, Camille Schlitz Hechimovich, Jeanne LaBelle and Sharon Fell Vande Sand; brother-in-law, Bill (Carol) Fell; along with many nieces, nephews, other relatives and friends. He was preceded in death by his parents, wife Nancy, brothers Jack and Richard Schlitz and sister Roseann (Richard) Foltz. The family would like to extend a special thank you to the staff at Aurora St. Luke’s, Lakeland, and Burlington Hospitals. The family would also like to thank Holton Manor in Elkhorn and St. Croix Hospice for their care and support. Memorials for Wayne have been suggested to the Harmony Club of Burlington and Transitional Living Center (TLC) in Burlington. Visitation for Wayne will be held on Saturday, April 6, 2019 from 10 AM until 2 PM at Schuette-Daniels Funeral Home with a Memorial Service beginning at 2 PM. Burial will immediately follow at Burlington Cemetery. To send flowers or a remembrance gift to the family of Wayne E. Schlitz, please visit our Tribute Store. 625 S. Browns Lake Dr.
"Email Address" would like to share the life celebration of Wayne E. Schlitz. Click on the "link" to go to share a favorite memory or leave a condolence message for the family.